Channel 9News - Reporting the News Whatever the Weather. When severe snow prevented 9 News (Denver) from using there access ramp they turned to AmbiRad for a solution. The only answer, without resorting to rebuilding the ramp, was to install overhead gas fired infrared heaters. 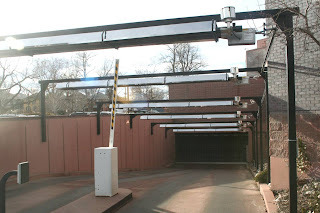 The system is designed to provide a high enough intensity of radiant heat to prevent the build up of ice and snow in even the harshest weather that Denver has to offer.